We take actions to protect and enhance our biodiversity, urban forest, waterways and air quality. We strive for low impact development and act to reduce and manage the impacts of climate change. High phosphorus levels can impact aquatic plants and animals, such as causing algae to grow faster than ecosystems can handle, decreasing oxygen levels and contaminating the water. Sources of phosphorus include fertilizers, manure, organic wastes, detergents and wastewater treatment plant effluent. The Provincial Water Quality Objective (PWQO) for phosphorus is 0.03mg/L. Average annual phosphorus levels for Sixteen Mile Creek and Bronte Creek have been below the PWQO standard of 0.03 mg/L since 2013. Although Fourteen Mile Creek has been frequently been above the PWQO, in 2016, all three creeks had annual phosphorus levels well below their respective ten-year averages. Chloride is another naturally occurring nutrient, however, at high levels it is toxic to aquatic life. Chloride persists in aquatic systems as there are no known processes by which chlorides are broken down. Elevated chloride levels in Oakville creeks are primarily a result of road salting during winter months. The Canadian Water Quality Guidelines for the Protection of Aquatic Life (CWQG) for chloride is 120 mg/L. Average annual chloride levels vary across Oakville’s creeks — Fourteen Mile Creek is consistently above, Sixteen Mile Creek fluctuates above and below and Bronte Creek has remained below the CWQG; however, as of 2014 the trend for all three creeks has been trending upward. How permeable a surface is determines how water moves through it. It can either be absorbed by soil or natural cover (permeable), or it can run off on surfaces such as roads, driveways, parking lots and most buildings (impermeable). Water that does not soak into the ground is called runoff and can pick up debris or toxins as it moves towards a waterbody causing polluted waterways. Runoff can also contribute to flooding and damage to property and infrastructure. This is becoming a growing concern with more extreme weather and intense precipitation events due to a changing climate. In 2017, about 45 per cent of the town had impervious land cover. Our forestry and stormwater management areas are looking at ways to expand the amount of permeable area to increase the town's resiliency to flooding. Since 2015, the Air Quality Health Index (AQHI) has been reported by the Ontario Ministry of Environment and Climate Change to communicate the health risk posed by air pollution. Exposure to air pollution can make it harder to breathe, irritate your lungs and airways and worsen chronic diseases such as heart disease, chronic bronchitis, emphysema and asthma. Studies have shown that even modest increases in air pollution can cause small but measurable increases in emergency room visits, hospital admissions and deaths. In 2016, 34 days were classified as posing a moderate health risk due to air pollution levels. The remaining days in the year were classified as low risk. The pie charts show the percentage of days in the year by health risk associated with air pollution levels. There were no days with health risks classified as being high risk or very high risk. Greenspace contributes to important ecological services such as better air quality, water quality, flood protection, climate stability and biodiversity protection. Accessing greenspaces and natural areas has been shown to improve mental and physical wellness, increase life satisfaction and foster stronger community cohesion. 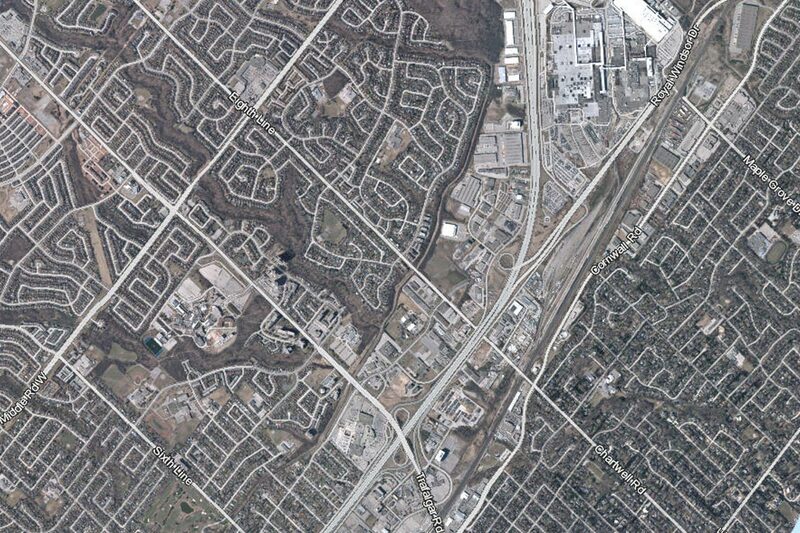 Oakville has 2,519 hectares of publicly owned greenspace. This includes Bronte Creek Provincial Park as well as Wildflower Woods and Glenorchy Conservation Area, which are managed by Conservation Halton. Over the last five years, the town has added 18 hectares of land to greenspace and the Parks and Open Space department continues to identify important land parcels for protection and opportunities to expand greenspace.